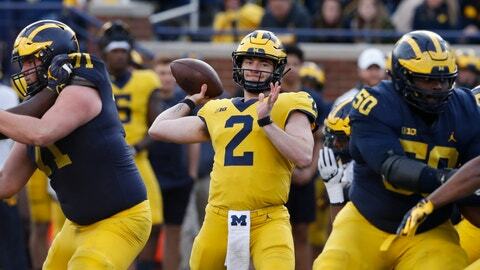 ANN ARBOR, Mich. (AP) — Jim Harbaugh has handed the keys to Michigan’s new-look offense to Josh Gattis , who is implementing a no-huddle, spread scheme. Between each shotgun snap, players look at the sideline to know what play is being called. Members of the football program’s support staff hold up a number of signs with visual clues such as a lightning bolt or a train. Former offensive lineman Grant Newsome, who had a career-ending knee injury, stands next to Gattis on the sideline and signals the plays he calls. “That one against Ohio State was unacceptable,” Patterson said, adding the setback played a part in him returning for his senior season instead of entering the NFL draft. “That’s definitely lit a fire under some guys,” McKeon said.